Today is September 1st. Summer is officially over and autumn is upon us. Time to retire the tank tops, shorts and flip flops and time to bring forth the sweaters, scarves and socks. But more importantly, finally time for boots! 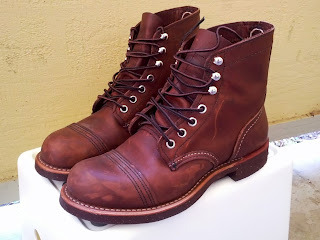 A couple of months ago, during high-summer, my husband and I bought our first pairs of Red Wing boots. He, The Gentleman Traveler and I, The Iron Ranger. Ever since, I've been waiting for boot season. And now it's finally here! Given that the climate in Northern California never require boots, I decided to wait for an appropriate date rather than wait for appropriate weather. These shoes are made from thick and sturdy leather, meant to last a lifetime and therefore can be quite stiff before they mold to your feet. To remedy this initial "softening period" and to set me up for future boot heaven, I've decided that these Red Wings boots will be my only pair of shoes I will wear for the month of September. I see this as a perfect opportunity to break them in and to experiment with the versatility of these boots. However, there is an exception to the "only pair I will wear"-rule. I will be wearing much more appropriate shoes while exercising. There will be no half-marathon training in leather boots!